Microcrystalline Hydroxyapatite (MCHA) is a natural compound that makes up the crystalline matrix of bone and teeth, and is the substance that gives them their rigidity. * MCHA contains highly absorbable Calcium and Phosphorus, which are the major mineral components of bone. 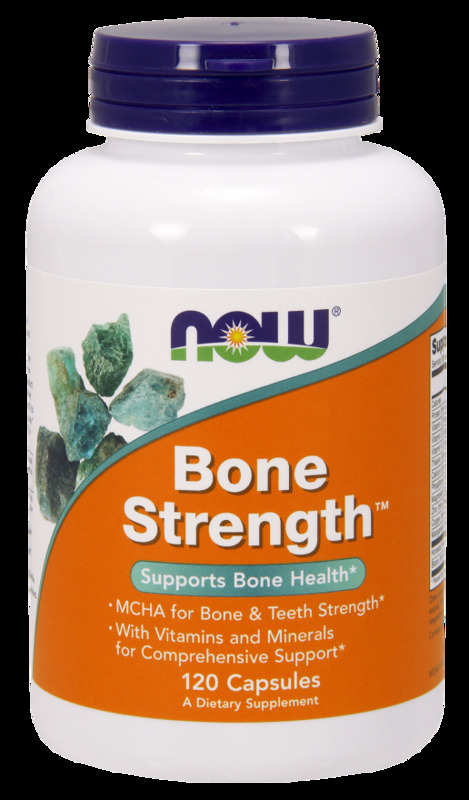 NOW® Bone Strength™ is a comprehensive bone support product with MCHA. It also provides Magnesium and other important minerals, as well as Vitamins C, D and K to aid in the synthesis and maintenance of bone tissue. * NOW® Microcrystalline Hydroxyapatite (MCHA) is derived exclusively from Australian cattle. Gelatin (capsule), Cellulose, Glucosamine Potassium Sulfate Complex, Stearic Acid (vegetable source), Magnesium Stearate (vegetable source) and Silica.